Does Katie look familiar to you? Picture her with a weather map behind her. Yep, this Helena Food Share volunteer is Katie Alexander the weather person from KTVH. 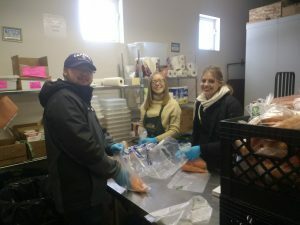 You can often find Katie volunteering her time at the Helena Food Share pantry on Tuesdays or Thursdays. She likes to work in the afternoons when the Pantry is open so that she can meet customers as they check out. Last summer Katie began gardening and enjoyed the connection she felt to her food. This spurred her to learn more about global food production. Already passionate about enjoying good food, Katie was fascinated about what she learned. 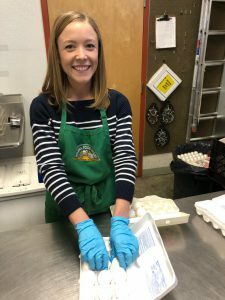 Volunteering at Helena Food Share is the perfect fit for Katie. With her job, Katie is often reporting things and wanted a way to feel actively involved in doing positive things in her community. Helping at Helena Food Share has filled that need for her. Katie says that in our relatively small community she feels like she can directly see the impacts of her service at Helena Food Share. Not only does Katie give to Helena Food Share, her employer, the Montana Televisions Network, is also a big Helena Food Share supporter. Throughout the year Montana Television Network (KXLH/KTVH) helps Helena Food Share in a big way. End of year giving commercials, Turkey Challenge advertisements and production of a video for the Beyond Hunger luncheon are just some of the things that the station donates to Helena Food Share. Katie is happy to work for a company that supports something that she’s passionate about. Just like you, Katie and KTVH are parts of the puzzle that help make Helena Food Share happen. Katie was volunteering in the Pantry when some of the KTVH staff came by to interview Bruce Day, Helena Food Share Executive Director. Katie put her co-workers to work helping bag oats for our customers.